The University of Alabama at Birmingham has increased its orthopedics clinic's collections and improved care coordination with the assistance of check-in kiosks. 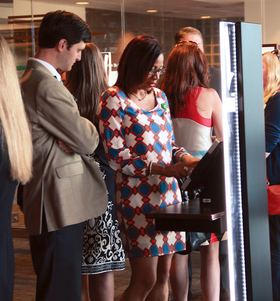 The University of Alabama at Birmingham rolled out registration kiosks at its orthopedic clinic that increased its collections nearly 60%, kept patients engaged and better coordinated care. The kiosks, which are provided and managed by Clearwave Corp., resemble those at airports and fast-food chains. They aggregate patients' insurance information, demographic data, copays, deductibles, medical scans and other test results. After the April 2016 installation of the kiosks, the amount of paperwork for orthopedic clinic check-ins decreased dramatically, the amount of time to check in dropped, upfront payments rose 57% and, ultimately, patients were happier, said Rob Crabtree, administrative director of orthopedics at UAB. The potential to reduce costs by ceding services to third parties is increasing hospitals' appetite for outsourcing. UAB now plans to install patient registration kiosks at its Kirklin Clinic, the largest multispecialty clinic in Alabama. Patients will have a better idea of the cost of care and physicians will be more prepared with all X-rays and pertinent patient information at their fingertips prior to treatment. "Patients check in in a more timely manner; (the kiosks) reduced the burden on staff and significantly increased collections," Crabtree said. "This has major potential for the healthcare industry, which has a lot of waste and paperwork." Other health systems have adopted registration kiosks including Sioux Falls, S.D.-based Sanford Health, which saw similar results with its partially outsourced kiosk. Sanford's pilot program, which the system plans to expand to more clinics, has increased the system's upfront collections dramatically and helped patients better understand the cost of care, said Michelle Bruhn, Sanford's senior vice president of finance for health services. "We are trying to look at other ways to treat our patients and help them understand the overall cost of healthcare so they feel empowered to meet that financial commitment," she said. "We want to bring information to patients in a familiar way." The kiosks are one example of services that providers are outsourcing to reduce costs and improve operations. Many hospitals and health systems are finding that vendors or partners are better suited to manage certain processes. Yet, protections are needed in these arrangements to ensure promised cost savings and outcomes are delivered (See sidebar, at right). "Because of the financial reality of hospitals, stones are being turned over in outsourcing that a few years back weren't being looked at," said Neil Olderman, a partner at law firm Drinker Biddle & Reath. "The biggest driver is being able to buy supplies and buy talent at a level that is less costly than what a system could do on its own. That, coupled with the knowledge a vendor brings around management, operations, recruiting and training, is attracting providers." Wayne Memorial Hospital in Honesdale, Pa., hired VestaCare to help turn around its collections. The hospital was collecting about $40,000 a month in patient revenue, but boosted that to about $300,000 by outsourcing parts of its billing and patient payment process, said Tom Brekka, CEO of VestaCare. VestaCare also guided Wayne Memorial's patient-facing staff through the cultural change needed to capture payment prior to treatment and help patients avoid receiving massive hospital bills or collection agency calls. Increasing upfront payments means Wayne Memorial can buy new equipment, recruit more specialists or expand its emergency room, said Michael Clifford, chief financial officer of Wayne Memorial. Another area of growing outsourcing interest concerns capital spending. Ascension Health, which spends around $300 million a year on routine equipment expenses across its 141 hospitals, hired software provider Attainia to drive efficiency in capital and construction projects, said Mike Rozenfeld, CEO of Attainia. "In an age of acquisitions in the provider and ambulatory space, to make things apples-to-apples so accurate decisions are made is a major need," he said. "The idea is to have all the relevant info associated with a piece of equipment and then to predict future placement and repair needs." The data reveals what equipment is underutilized or unnecessary, which helps providers avoid frivolous purchases, Rozenfeld said. Ascension could not be reached for comment. Edward-Elmhurst Healthcare, based in Naperville, Ill., outsourced its equipment management, which helped improve care and lower costs, said Jeff Friant, vice president of finance. The system hired OpenMarkets, which uses a platform similar to Attainia's to help hospitals and suppliers create a better equipment procurement process. Amid nationwide labor shortages in areas like primary care and nursing, outsourcing has also extended to specialists. Providers that can't find qualified medical professionals or don't want to get tangled in employment issues are contracting out in certain specialties, one of them being OB-GYNs. OB Hospitalist Group has a network of more than 600 dedicated obstetrician hospitalists serving 120 active and onboarding partner hospitals across 28 states. It handles all the recruitment and staffing responsibilities while reducing a hospital's risk exposure, which can allow a provider to focus on its core services, said Jami Walker, director of hospital operations at OB Hospitalist. A dedicated 24/7 group of on-call hospitalists can reduce variation in safety and quality, improve patient satisfaction and reduce physicians' workloads, Walker said. "Forming partnerships with each hospital allows us to understand the needs from a patient standpoint and a community standpoint," she said. "The traditional model is not sustainable, especially with an aging medical staff." Contracting out specialists can also help manage the ebbs and flows of demand for certain procedures, Walker added. Many independent physicians and smaller physician groups that can't keep up with compliance costs and changes to payment models are migrating to bigger groups or health systems. But some vertically integrated models will inevitably fail given the added expense and the complexity of managing physicians, said Joel French, CEO of SCI Solutions, which offers web-based access management products that connect patients, referring physicians and hospitals. "Physician compensation is one of the fastest-growing expenses in health systems," he said. "It has become as high as 10% of total expenses for some systems." Some providers are turning to virtual integration, which allows a physician to remain independent while centralizing administration, spreading risk and gaining leverage with health plans, French said. Hospitals and systems are looking to provide treatment and instill healthy habits on a patient's terms, hoping that will lead to better engagement and outcomes. So providers are searching for new ways to reach patients to keep them healthy and engaged in their care. Many have found that community organizations are more effective and quicker, so they're outsourcing parts of their outreach. Baylor Scott & White has teamed up with the city of Dallas to provide nutritional and physical education services to the community that have helped cut hospital admissions nearly 40%. Baylor Scott & White works with city-owned recreation centers to coordinate physical activity plans and partners with local churches that offer healthy foods and nutritional advice at farm stands in food deserts, said Dr. Donald Wesson, president of the Baylor Scott & White Health and Wellness Center at the Craft Recreation Center. It took several years for the system to learn from its mistakes and let the community direct its healthcare needs, Wesson said. With the help of its community partners, Baylor Scott & White reduced its emergency department admissions by 17% and inpatient admissions by 37%. "We recognized that we needed to partner with people in the community to best deliver care," Wesson said. Related​ story:​ "Extra​ steps​ needed​ for​ successful​ outsourcing​ relationships"